Size of this preview: 800 × 513 pixels. Other resolutions: 320 × 205 pixels | 640 × 411 pixels | 1,024 × 657 pixels. 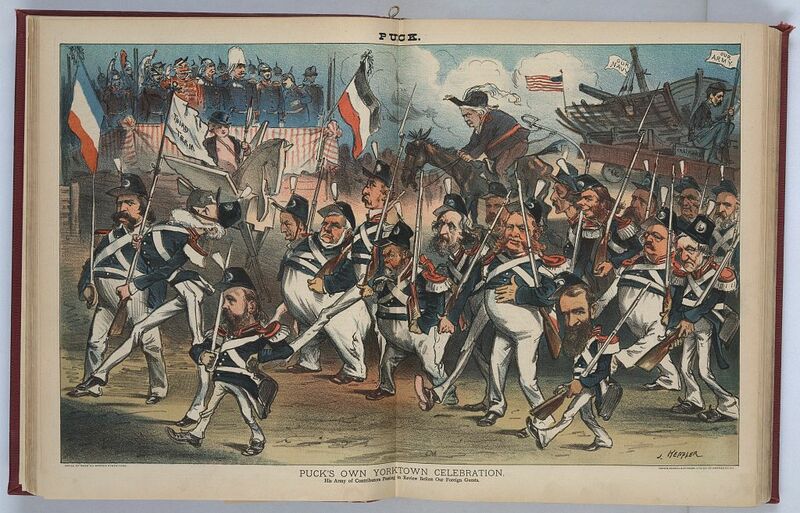 Abstract: Print shows Puck sitting on a wooden cut-out Pegasus reviewing a procession of soldiers, among whom are John A. Logan, Roscoe Conkling carrying a flag labeled "Third Term", Joseph W. Keifer, William M. Evarts, David Davis, James G. Bennett, John Kelly, Cyrus W. Field, William H. Vanderbilt, Jay Gould, Samuel J. Tilden, Benjamin F. Butler, Thomas De Witt Talmage, and riding on horseback, Henry Ward Beecher. Following the soldiers, in the background on the right, is a float showing an old soldier labeled "Our Army" and a decrepit ship labeled "Our Navy". In the background, on the left, is a reviewing stand for the "Foreign Guests", with a French flag on one side and a German flag on the other. Physical description: 1 print : chromolithograph. Notes: Caption: His army of contributors passing in review before our foreign guests. ; J. Keppler. ; Illus. from Puck, v. 10, no. 241, (1881 October 19), centerfold. ; Copyright 1881 by Keppler & Schwarzmann. ; Title from item. Alternative names Joseph Keppler; Joseph Keppler Sr.
under the digital ID ppmsca.28522.